Lanyards are a great promotional tool – not only does the wearer get a constant reminder of your business, those around them will see your business name as well. Our lanyards have a great range of uses, from events and functions through to every day office use. 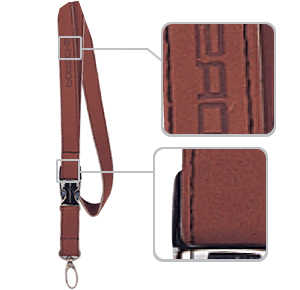 One of our more popular branded lanyards is our Faux Leather Lanyard. With the look of leather, this lanyard provides a stylish look and comfortable wear, all while having the benefits of the general lanyards on the market. Our Faux Leather Lanyard lends itself to a great logo print with the option to either emboss your logo or have a classic logo print. There is one big benefit our customers have found using promotional lanyards – the constant form of advertising they bring. Customised promotional products will often stand out from generic promotional items simply because they are different to what is on the market. Because promotional lanyards provide a constant reminder of your business, many company’s will use the same style of lanyard for years – they don’t go out of fashion and are always useable. Whether your staff use them daily, or they are given to customers and clients as part of a function, having your company name out there will bring you more exposure than a traditional advertising campaign. These Faux Leather Lanyards are available in a range of three different colours – black, brown and white – with all of them having a traditional leather look. We also have a large range of attachments and accessories to let you customise the lanyard to your needs. Some of our more popular attachments with our Faux Leather Lanyard are the Dog Clip and the DC004 clip, while the Retractable Badge Reel and our PVC Card Holders are the more popular accessories. If you find yourself in need of a promotional lanyard that you can use over and over in your business, our Faux Leather Lanyards are the perfect mixture of style and comfort.